Before you say “that’s stupid” or write this off as another blogger being negative about the team, hear me out. I do think the Rangers are still an elite team. I do think they’re in the mix for a Stanley Cup. And I do think this team has room to be much better. But they’ve been downright bad in some situations. It’s hard to criticize a team that has won 11 of their last 12 games, and they’re tied with Montreal and Dallas for the most points in the league. While those teams are playing well, controlling possession and scoring a lot, the Rangers are managing to win despite stinkers like the game against Nashville. 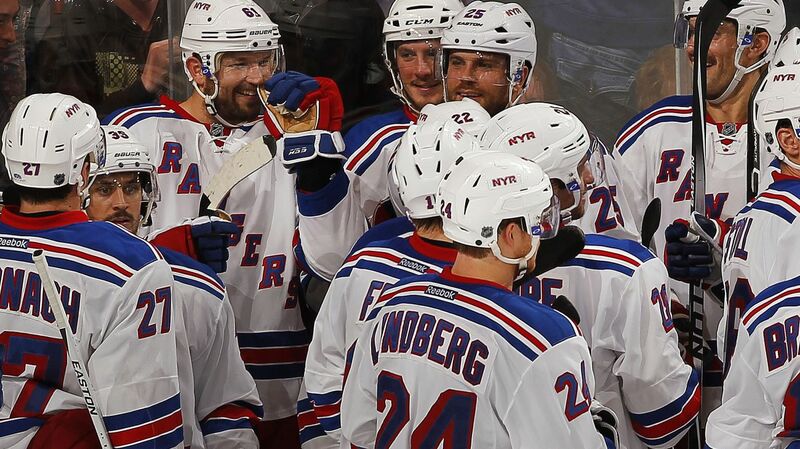 This season, #Rangers have a plus-32 goal differential during 5-on-5. Next-highest team, Montreal, is at plus-11. No one else above plus-9. Let’s take the last two wins for example, a 5-4 overtime win over the Florida Panthers and a 3-0 shutout win over Nashville. Against Florida, they allowed 43 shots against, forcing Henrik Lundqvist to make high quality save after high quality save. They took a 4-2 lead late in the third period, and then proceeded to take their sixth penalty, which led to a goal, and failed to take possession and clear the puck, leading to Jaromir Jagr tying the game with less than two minutes left. Oh yeah, and then they tripped Reilly Smith on a breakaway, forcing Lundqvist to make a save on a penalty shot in order to avoid a regulation loss. Lundqvist was rightfully pissed off and outspoken after that win, saying that the team was sloppy and needed to play better. He didn’t say it directly, but he essentially alluded to the fact that the team was playing really poorly in front of him, and needed to step up to take pressure off of him on every play. When your franchise goaltender speaks up and demands better play, something he almost never does, you would think that the team would listen right? Wrong. Just two nights after the sloppy play and careless penalties taken by the Rangers, AV’s squad was right back at it against Nashville. They took four penalties in the first period alone, were outshot 25-7 and out attempted 62-21 after 40 minutes, and had minimal possession. What was good about this game was the blocked shots (26), taking some of the pressure off Lundqvist, as well as playing a really strong third period. These two games are just a few of the examples where the Rangers have been outshot and outpossesed and still managed to come away with wins in almost all of those games. The team has posted a ridiculously high PDO, which is the team’s shooting percentage combined with their save percentage, both a 5v5. This number tends to regress overtime back towards the norm of 100.00. Not always, but usually, which means that the Rangers could go through a spell that the Predators are going through now (0 goals in over 213 minutes). #Rangers‘ 5-on-5 shot% of 11.1 is the highest in the NHL, and would be Rangers’ highest ES shot% since data is available (2005-06). The difference between the 2013-14 Colorado Avalanche and the 2014-15 Calgary Flames (very high PDO), and this year’s Rangers is the structure of each team’s roster. The Avalanche and Flames both rode an absurdly high PDO to the playoffs and enjoyed great seasons. The year after, those numbers regressed, and they fizzled out of the playoffs. But the Rangers shouldn’t be too worried about this, because of their depth and elite goaltending. While they don’t have a star like Patrick Kane or Steven Stamkos, the Rangers have more good players at every other position than just about every other team in the league. Also, Henrik Lundqvist is a top two goalie in the league every single season, and right now, he’s the best goalie on the planet. So that means that this team has a bit more leeway than anyone else. #Rangers Henrik Lundqvist set career-bests in his Vezina season of ’11-’12 with a 1.97 GAA and a .930 sv%. This year, he’s at 1.74 and .946. But there is no doubt that the Rangers need to play much, much better. The only player on the team with a corsi for% of 50.00% or higher is Keith Yandle, and Rick Nash leads all forwards with a 49.26% corsi. That needs to change. Getting outshot and not having the puck, plus relying on Lundqvist to maintain a .961 save percentage at even strength is not a recipe for success. If Vigneault marches his troops into the playoffs and they get outshot and outpossessed in every period against some really good playoff teams over a seven game series, they aren’t going to win a championship that way. The coaching staff needs to start making some serious changes and get the team playing better regularly. Chris Kreider hasn’t been that impressive, Derek Stepan’s season has been a rollercoaster with highs and lows in his play, and nobody has solidified the second line right wing position. The team has been making a lot of terrible mistakes and turnovers, especially the defense, and forcing Lundqvist to stand on his head. If this continues, the team will be in some trouble as the year goes on. But I don’t expect this to last for 82 games. Eventually, the Rangers are going to get back to the kind of hockey they played at the end of last year and the possession numbers will start balancing out. And the fact that they haven’t come close to reaching their full potential yet is a frightening thought for the rest of the NHL. Posted on November 24, 2015, in In the Crease and tagged Aaron Ekblad, Alain Vigneault, Chris Kreider, Dan Boyle, Dan Girardi, Derek Stepan, Derick Brassard, Dominic Moore, Dylan McIlrath, Emerson Etem, Filip Forsberg, Florida Panthers, James Neal, Jaromir Jagr, Jarret Stoll, Jesper Fast, JT Miller, Keith Yandle, Kevin Hayes, Kevin Klein, Marc Staal, Mats Zuccarello, MSG, Nashville Predators, New York Rangers, New York Rangers blog, NHL, NHL corsi, NYR, Oscar Lindberg, Pekka Rinne, Rangers, Rangers blog, Rangers corsi, Rangers Panthers, Rangers Predators, Rick Nash, Ryan McDonagh, Viktor Stalberg. Bookmark the permalink. Leave a comment.